When I started to post the Be Happy Doodles on Facebook, people asked me if these doodles were available as greeting cards. 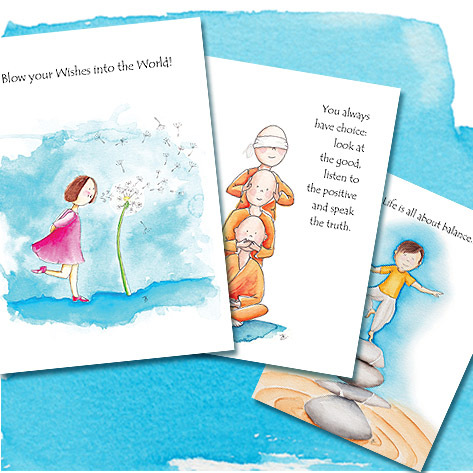 This was not something that crossed my mind when I initially started drawing them, but I do like the idea that the inspirational doodle quotes can be send as postcards to friends or family – to lift them up or let them know that they are on your mind. Although it was very hard to make a choice from all the doodles, I finally picked five drawings which are closest to my heart. This week I will send the designs to the printing office to make it real! I’m so excited about this first step of the doodles in the tangible world. Doodles, I will set you Free! When you are interested in getting your set of the Be Happy Doodle cards you can order them by using the contact form.